A team of students and lecturers of the master programme Digital Healthcare at the St. Pölten University of Applied Sciences won the first prize in the category “Best AR App” of the Amazon Sumerian AR/VR Challenge. They developed an Augmented Reality app for digital healthcare which explains body parts and functions. The app is available for free in the Google Play Store. A study conducted by Bertelsmann found out that in case of health problems, 58 percent of all people google their symptoms before consulting a doctor. These searches, however, often lead to incorrect assumptions. “With our app ‘Digital Healthcare Explained’, we want to offer channels which healthcare experts can use to answer precisely this type of questions. Our students combine digital storytelling with 3D applications in Augmented Reality in order to explain subjects in a captivating and unique fashion”, says UAS lecturer Andreas Jakl. 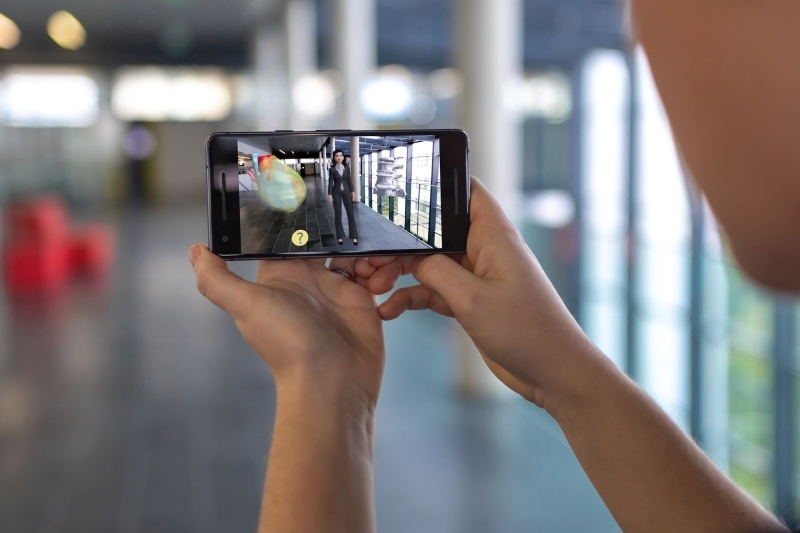 The app developed at the UAS uses Augmented Reality in order to make health topics accessible for laypersons – such as the structure of the heart and magnetic resonance images of the brain. In this process, the app places the virtual, three-dimensional models directly in a real environment, which makes it easy for users to explore them: they can view the content from all sides by walking around it. At the same time, a virtual avatar shares relevant information on the body parts and possible illnesses. The objective is to make people understand imaging procedures and medical interventions better and thus take away their fears. In the study programme Digital Healthcare at the St. Pölten UAS, Andreas Jakl teaches the visualisation of health topics. The students combine 3D graphics, sound and voice with medical topics. “Patients and healthcare professionals show great interest in incorporating new technologies into health education and therapies. Our project shows how easy it is for someone in healthcare to quickly develop an Augmented Reality application, without the need for advanced skills in programming or computer science. This allows the healthcare professionals to make use of technology in a creative and innovative manner”, says Elise Mandl, student of the master programme Digital Healthcare at the St. Pölten UAS. For their app “Digital Healthcare Explained”, the students used the programme “Amazon Sumerian”, a 3D design platform for Augmented and Virtual Reality. The prize money for the Hackathon amounts to USD 1,000 plus vouchers for Amazon cloud products. The team of the St. Pölten UAS was made up of Andreas Jakl, Elise Mandl, Bernhard Ruhrhofer and Gerald Wagner.